The Autonomous Bougainville Government on Monday granted its second mining exploration license to a Philippines company in a low key event at Tunania, the seaside home of Bougainville crisis commander of rebel forces, Sam Kauona. The event was set against the sombre double backdrop of the bloody crisis which had begun as a protest against mining giant Bougainville Copper in 1989 and a desperate race against time to get some serious investment on the ground before the referendum next June to decide the question of Independence for the Autonomous Region of Bougainville. Bougainville Exploration License no. 5 covering a 183 square kilometre area was launched by Bougainville President Dr John Momis with a plea to stand “united” and “strong”. The echoes of the crisis were palpable here and brought a sombre note to an occasion that speaker, after speaker suggested, was “the turning point”, “a special milestone”, “a breakthrough”, and a fresh start”. The silence and the people’s reactions spoke more forcefully than the speeches. The people gathered in small silent groups under the shade of trees and coconut palms, more observers than participants, while the representatives of Philippines company, SR Metals Inc. battled it out in the clearing under the blazing sun, appearing to all like a graduating class of foreigners in some Bougainville initiation ceremony. The chiefs of nine affected clans were first called out and they gave their blessing and permission for the forests to be disturbed in the interest of all during the exploration period. Then each speaker coaxed the people to leave their fears behind and take a leap of faith. Bougainville President Dr John Momis said: “Bougainville now stands at the threshold of a new social, economic, political, and moral order. “Independence is imminent, just round the corner. But Independence will not just happen. We dream dreams and we want to be free. We want to be free agents of development. We want to break away from the syndrome of dependency and economic exploitation and manipulation by those who have money because we treasure our people and their resources. Masiu called on the people to trust in the leadership of the ABG and be responsible partners in all undertakings if there was to be real meaningful development. The SR Metals Inc Managing Director Eric Gutierrez said his people were ready but would mobilize only if the company was invited by the Government and the people. Kauona, representing women, said: “We mothers bore the burden of the mining industry here in Bougainville. 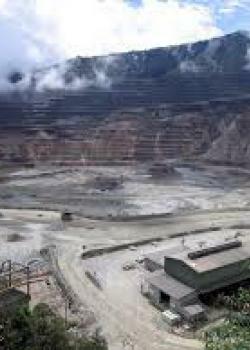 20,000 people have died because of this industry, because of Panguna mine. Our children have bathed this island with their blood. Today we celebrate because this new deal has been forged out of the expensive and fresh blood of our children.